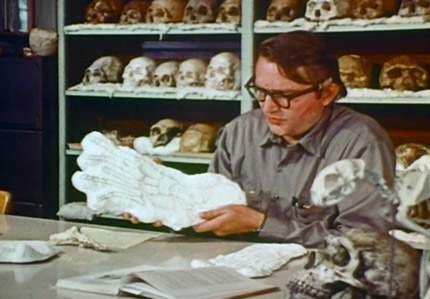 Physical anthropologist Dr. Grover Krantz analyzes a cast of a footprint in archival footage seen in the documentary Sasquatch Odyssey. When I lived in southeastern British Columbia, Canada, I enjoyed hiking in the Bugaboos northwest of Radium Hot Springs and Kootenay National Park. It was a remote, pristine wilderness area accessible only by a 45-kilometre long gravel logging road. Traveling up to the area in late September or early October before snowfall was perfect because the ground would be virtually frozen, allowing for easy travel over an otherwise muddy roadway. Famous for mountain climbing and alpine skiing, the Bugaboo Glacier is massive, cradled in rocky mountains with dogtooth-like peaks jutting out of its ice field. Since I ventured there twice on my own, I only went a little ways up the hiking trail before it turned into a more risky path on the edge of a cliff more suited to climbers with equipment. There were often only a couple of vehicles in the parking lot, so I generally would only come across few hikers. It was my second trip to the Bugaboos in 1994 that I wandered up into the alpine meadows and found a huge boulder to have a rest on. I had a rather euphoric nap lulled by sunshine and the fresh mountain breeze. After reaching an overlook where I could view the entire valley and glaciers in the magnificence, it was getting to be mid-afternoon, and I thought it best to head back with the half day drive back home. There was a low-lying forest at the bottom of the valley, not far from the parking lot. There had been a massive frost, and all of the trees and boulders were covered in ice crystals, making for a magical white kingdom. The air was cold and fresh. I was in quite a calm, relaxed state when I suddenly heard crashing through the trees. I stopped, heart racing, alert that it might be anything from a deer to a bear making the racket. The crashing ceased and I continued walking, only to be confronted by the stinkiest smell imaginable, very strong in the pristine, frost-covered woods. It was very much like an incredible human body odour. I’d never smelled anything like it in the wild, and never have since in my many hikes. I stopped, and heard nothing in the woods. No more crashing noises. Just the silence of mountain woodland. The smell disappeared after a few minutes of walking. A satellite image of the area in which I encountered the strong smell. 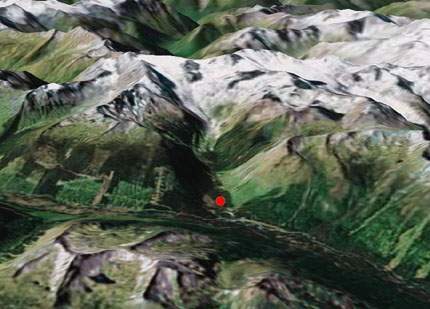 The red dot marks the approximate location. Von Puttkamer added, “Hastings had worked for the fish and wildlife service, had been a trained observer all his life and he knew this was no bear. Then there was the smell - often mentioned in Bigfoot sightings. Hastings said he’s hunted bear and elk - he was familiar with those smells; this was more of a human body odour type smell.” In the documentary, Hastings described bears as having musky, dirty smell, not like human body odour he smelled. 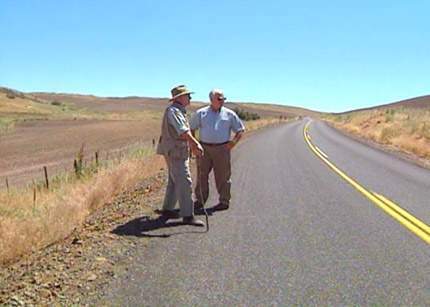 Peter Byrne, left, and retired state trooper Jim Hastings revisit the spot where Hastings had sighted a sasquatch-type creature. Considering what I had experienced, it is striking to me that Jim Hastings, an experienced officer of the law who also had significant knowledge about hunting and the wilderness, described the body odour smell along with his visual sighting of what appeared to be the legendary sasquatch. Bigfoot is also popularly known as the Skunk Ape in areas where the creature has been reported. This is because people have reported a smell much different than human body odour in the woods. However, I do not know how many people have reported such a skunk-like smell in conjunction with a visual sighting. It is more common to come across such reports from people who had an experience suggesting that there may be a sasquatch in the vicinity without actual visual contact being made. Of course, there are many things that can make a skunk, dead animal or rotten eggs smell in nature, from skunks themselves, to skunk cabbage, to sulphur emissions from hot springs. Smelling a strong human body odour in the open mountain air, however, seems more inexplicable. And the testimony of Jim Hastings makes me wonder even more about what I came close to crossing paths with that autumn afternoon in the Purcell Mountains.